My website is not working in Firefox. Your certificate has been revoked by the CA that issued it. OCSP                The CA      Check                              ? n/a     ? So it seems your certificate is revoked since 2018-11-13. 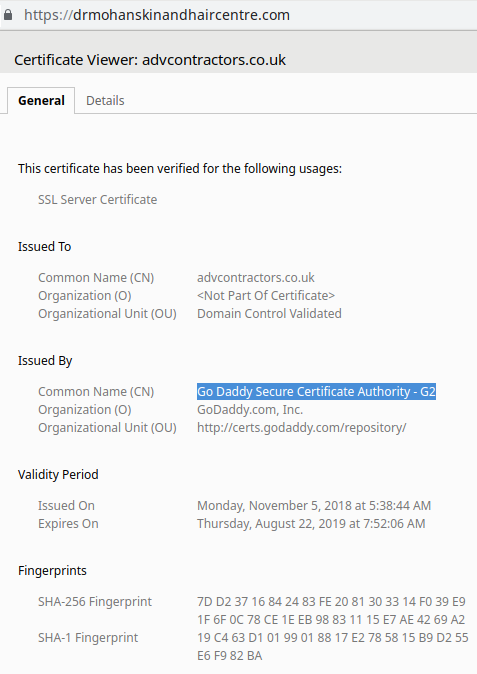 And if you search for all certificates on your hostname, at https://crt.sh/?q=drmohanskinandhaircentre.com you find quite a lot of certificates issued in a short timeframe, which is odd. You need to contact the CA or the provider of this certificate and request another one, since the current one is now useless. If you want, you can also ask why it was revoked, but you may not get an answer and even if you do that will not help solving your problem. Also note that not all browsers are doing OCSP checks and they might be disabled, broken or filtered out. Hence some browsers may be able to connect to the website just because they are not doing the OCSP check needed to discover the revocation. With a certificate like that, if there is a problem with any name (like a name changing holders or not being renewed, in which case the CA is required to revoke the certificate per CAB Forum requirements), the whole certificate has to be revoked, so all names in it share fate. Not the answer you're looking for? Browse other questions tagged security-certificate error firefox certificate-revocation or ask your own question. Is RapidSSL WildCard Cert suitable for my eCommerce Web site? What can cause a connection reset when site is visited with Firefox?